wow, the ultimate VTOl aircraft. this uses minimum motors and is the optimum way for a VTOL fixed wing. another aircraft is boeing OSPRAY which uses similar technology. very simple to built from scratch. only challenging part will be tilt mechanism. welcome AP2.8. I am sure one day AP will bring this surprise. 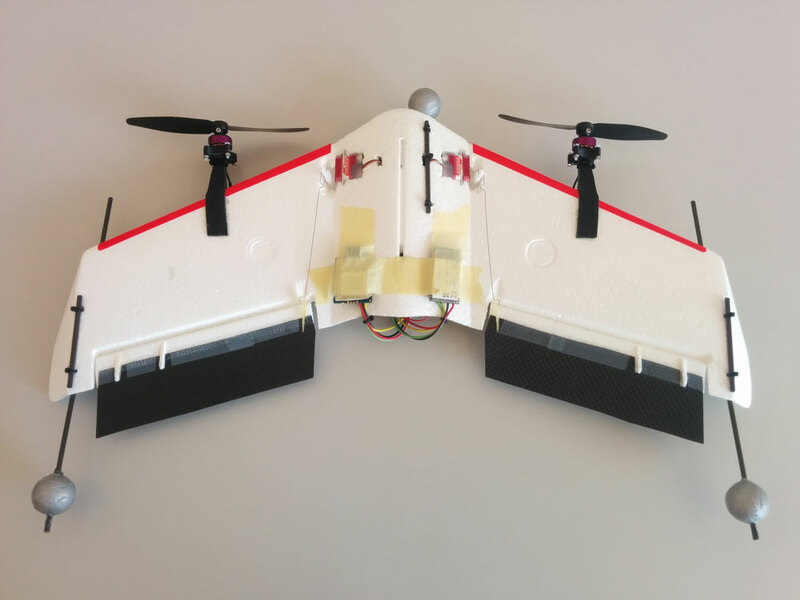 Does it mean that a one-engine Delta wing can take off from standing postition (like on the picture in this link: http://diydrones.com/profiles/blogs/miniracewing-fly-fast-stay-low) and then do a transition to forward flight ?? I'd really be interested in the next step which would be to use separate servo's on the tilt wings for yaw control, so the rear prop could be fixed instead. Differential tilt on the wings could then could also become aileron control, or elevon on a wing type aircraft. That plus using larger wing prop/motors to produce most of the lift would probably shrink the components of a VTOL/QP to the absolute minimum (3 motors and two servos). @JB I have written a fork to do this on a custom airframe using the tilt servos for yaw. It works very well in a hover, very hard to make the mechanism strong enough for forward flight while being fast enough for yaw. @Tommmy, not yet, but I am planning on adding tail-sitters soon. @JB, it would be simpler to just make it behave like a dual-copter, using large elevons for pitch control in hover. @Ravi, I think supporting an Osprey type model in ArduPilot won't be hard now. Maybe you should buy one (there are several available) and we can work on it? Tridge, are front-motor-yaw tricopter layouts supported? I know there was a PX4 version but not sure if that's the same thing here. I'd be interested in trying it if I may. Can you link to the fork please? I'm looking at a small custom airframe, sub 1kg, with a lift body, so I'm hoping for fairly small high aspect ratio wing area that should be easier to move fast enough for yaw. Like that it's mostly just the wingtips with rotors that rotate instead of the whole wing, which need not be as structural. The idea is to use a very large, third, non-pivoting rotor as the main lift rotor (that stows in the fuselage when not in use, by braking the rotor at the right spot), meaning the two smaller rotors on the wings can have props/motors optimised for forward winged flight (read high cruise pitch props on small motors). That way it avoids the orientation problems that tail sitters suffer from, so wings can always point into the wind, even in hover. (ie the airframe maintains the same level attitude regardless if in hover/forward flight). Essentially a Osprey configuration with small props for attitude control in forward flight and hover, and one large fixed prop for hover, that shuts off in forward wing flight. Tridge do you mean a dual motor tailsitter like this? Your idea is very interesting and sounds promising. Getting majority of lift with a non tilting motor would solve a lot of structural issues as the tilting mechanism can be weaker. I think your solution would be easy to code for. Its designed for a +quad configuration with counterrotating tilting wing motors. I built it on tridge's tiltrotor code but i had to hack the tiltrotor stuff up a bit to make it work. The code smells but it works in the sim and is promising in real life.